The ability to recognize a statement as a fact or opinion is a skill all students should master. 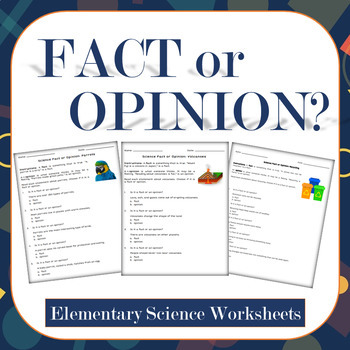 This free collection of science themed fact or opinion printables offers a way to integrate reading skills with your science curriculum. 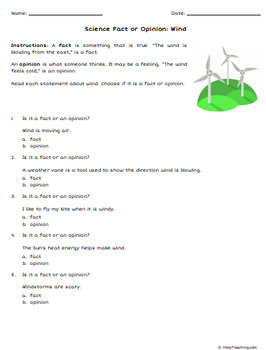 The bundle includes 5 single-page worksheets, each featuring five fact and opinion statements for students to identify. 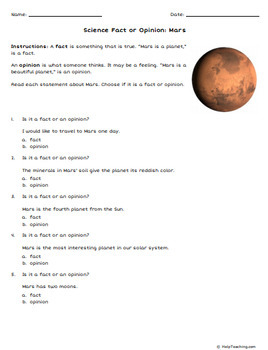 Worksheet topics are: Mars, Parrots, Recycling, Volcanoes, and Wind. Answer keys included. You may also like our Informational Text Reading Bundle for Grades 2 – 3. 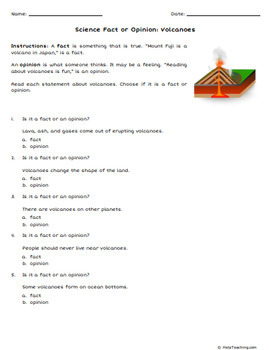 Find more science worksheets and reading strategy worksheets at HelpTeaching.com. Please review this product to help us evaluate our product quality.